Scientists explain heredity through genetics. Inheritance of man’s intelligence has yet to be explained. People believe children inherit the intelligence of parents, to some degree, just as inheriting physical resemblance. Dealing with intelligence, the question remains whether one inherits intelligence from one of the parents or both. In this context, I recall an incident relating to the eminent dramatist and novelist Gorge Bernard Shaw, who was born in the 19th century in Ireland, lived through part of the 20th century and was renowned for his intelligence, but unattractive in his physical appearance. He has had a long friendship with the British actress, Patric Campbell who had a unique beauty. Their friendship had never culminated in any sexual relationship. The actress was fond of Bernard Shaw. She had once suggested to Shaw that she would love to have a child by him since she adored the idea of having a child, with a combination of his intelligence and her beauty. Bernard Shaw had replied that it would be tragic if, on the other hand, the child would inherit his unattractive physical appearance with her low level of intelligence. Facts, such as these, show that people all along had believed that a child, to some degree, inherits the mental ability of only one of the parents, though no clue has been available as to its process. Observations on this subject, over a period of time and certain conclusions have been made, “X” ray pictures of the head of a few people have been taken to clarify doubts. With the help of the “ X “ ray pictures and the observations, the following conclusions are documented. How many of us know that there are three main component bones in the human skull. These bones are called 1. Frontal Bone (fore head) 2. Jaw Bones Set (Upper and lower) and 3. Skull Bone. Do we know that these bones in the mother and in the father produce an interesting combination in creating the offspring. You learn more when you read further. The human being is a combination of the physical and mental features of its parents. Nature conforms to definite patterns in the combination of features occurring when one is conceived in the womb. It is desired to analyze the patterns of combination. The patterns of combination are outlined here in two stages. It is observed that we inherit our limbs, the complete arms and legs, from one parent and the trunk of our body from the other parent. Most people know that the legs and arms are inherited as pairs. There are only two alternate combinations occurring in the Human Body. The complete arms and legs of one of the parents combine with the trunk of the other parent and vise versa. The diagram illustrates. This fact could be easily verified. If careful observation does not suffice, photographs could be used. 2. Trunk of the other parent. In the process of the combination, the Frontal Bone of one of the parents, combine with the Jaw Bones set of the other parent, to make the face of the offspring. The next step in the completion of the head, is joining with the Skull Bone, derived from any one of the parents. 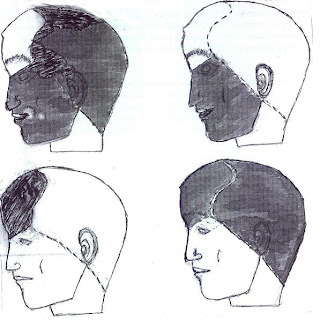 Accordingly, the upper part of the face of any individual resembles one parent while the lower part resembles the other parent. These facts are based on observation and X ray pictures. We have above a picture of the combination patterns in the head and the body. We would now proceed to identify the parent, whose brain is inherited by the offspring. With regard to inheritance in one’s initial mental strength and behaviour pattern, the deciding organ is the brain and it is necessary to ascertain, from which parent the brain is inherited. The brain like all organs is inherited by the offspring only from one parent, the mother or the father. It is inherited as a separate organ either along with the frontal bone or with the skull bone, from a particular parent. It has been observed that where the Frontal bone and the Skull Bone both are from the same parent, the brain is inherited positively from the latter and where the Frontal Bone and the Skull Bone are separately inherited from the two parents, the brain could come from either. To determine from which parent the brain is inherited, under this category, it is necessary to depend on the behaviour pattern and the mental ability of the individual, after growth. In the second category above, it may interest one to learn that there are pairs of twin brothers and sisters with the identical combination structure of the head, but one of the twins resembling the mother while the other resembles the father, in respect of their initial mental strength and behaviour pattern. While on the subject of the composition of the face, it is observed that the combination patterns of the nose and the eyes, follow three altogether different patterns. 1. The nose and the eyes resemble those of the parent whose forehead is in the combination. 3. The eyes resemble those of the parent whose forehead is in the combination while the nose resembles the nose of the parent whose pair of jaws is in the combination. The above 3 combination patterns are due to the fact that the sockets of the eye balls rest on the frontal bone as well as on the maxilla, the upper jaw. Hence the eyes are inherited either along with the frontal bone or the upper jaw bone. The inheritance of the nose too is based on the same principal. However, it is not possible for the eyes to be inherited along with the upper jaw bone (Maxilla) while the nose is inherited with the frontal bone. It is observed that the voice of a person resembles either that of the father or of the mother. It is mainly connected to the identity of the mouth and the nose. If a person’s mouth and nose both resemble a particular parent, the voice too would resemble that of the latter. But if the mouth resembles that of one parent and the nose resembles the other’s, the voice could resemble that of either. A voice could be feminine or masculine. A boy could inherit a feminine voice from the mother and a girl could inherit a masculine voice from the father. Following are the elements which can be compared by shape with those of the two parents. 1. To ascertain from which one of the parents an individual’s brain is inherited. 2. With the help of two photographs of the head of an individual, one of them taken laterally and the other taken frontally and two similar photographs from each parent of the individual, the parent from whom the brain in inherited could be identified. 3. With this knowledge parents can understand why all their children do not have the same level of ability and intelligence. Not understanding this fact that children of the same parents can have two different levels of ability and intelligence can lead to mismanagement of children. Initially, four different combinations in the offspring occur, as illustrated in the diagrams using two different colours representing the mother’s contribution and the father’s. Organs resembling the mother’s in "white" Organs resembling the father’s in "Grey"
1. 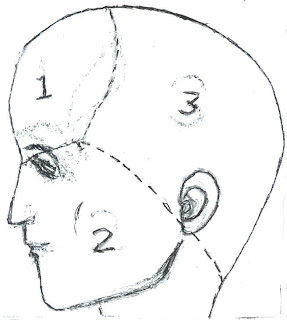 The three main component sections of the head (viz frontal bone, skull and jaw bones unit) of the mother and the father result in the above four combinations. 2. The nose and eyes provide a further three different combination. Hence there is a possibility of producing a maximum of twenty four different combinations by each couple of parents. Very little is known about the physical combination details of the sperm and the ovum in the reproduction process. Parents want to know whether their child resembles its mother or the father. Regarding physical appearance of offspring answers to possible questions could be found in the contents. Regarding the mental side of offspring, too, answers to possible questions would be available. It would also be refreshing and interesting to know in what manner we are formed, in respect of the physical and mental features of our parents. The information is specially useful to understand such as the case of a child when it lacks a high level of intelligence of its father. The father could understand and always find solace, where the intelligence of the mother is only ordinary. We can also see the various phenomenon that have become useful to nature to provide variety in the human race.